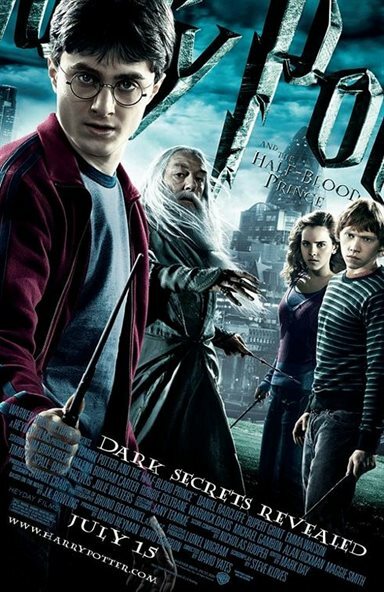 Download Harry Potter and the Half-Blood Prince in Digital HD from the iTunes store. 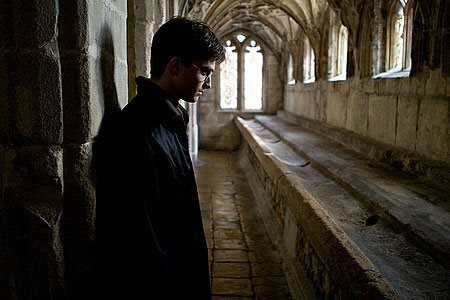 Harry Potter and the Half-Blood Prince images are © Warner Bros.. All Rights Reserved. Story/Script/Plot Development (C): For reasons unknown to me, this movie has differed significantly from the original book. Mind you, the ending is the same, but the movie took a different path. The movie title is about a "Half-Blood Prince", yet all we know about the Half-Blood Prince from the movie is that he corrected a textbook that we see in the movie, and the identity of this person is finally revealed in the last 10 minutes of the film, in an almost "I am your father" kind of moment that falls flat on its face and makes no sense in relationship to the rest of the movie. It reminds me of the third book/movie Harry Potter and the Prisoner of Azkaban, which seems to go nowhere and is really a setup for the next two movies that follow. This movie seems to be the first of a trilogy (since we know the last book will be cut into two films), and does not have a complete story to tell because of it. It seems as if the true climax of the film is really about 12 minutes before the end, which if it had been done properly would have made M. Night Shyamalan proud. But alas, it doesn't. That is the story-line of the book. This story, however, is mainly a "growing up as a teenager and dealing with teenager things" movie, or kind of like iCarly meets Wizards of Waverly Place if it wasn't for the pesky little details of the original book. Granted, I do know that this was implied in the original novel, but J.K. Rowling didn't go into as much detail as the movie did. Had the movie focused on that, it could have hit a home run. This part of the story allowed the characters we know so well to actually grow and develop as the "year" goes on, something we haven't seen much of since the third movie and a little in the Order of the Phoenix. Because this portion of the movie is done quite well, it keeps this section from getting below a C grade. Cinematography (C): While not using as many of the stunning sweeping visuals that have encompassed the previous versions (except for the opening sequence over London), but it doesn't hurt or help the movie here. However, there were more than a few shots that seemed to take too long to change the focal point, and that became distracting during those times. Acting/Chemistry (A): This is where the movie shines. Even though most of the cast has been together for five movies, in this movie they really seem to gel compared to the others. Daniel Radcliffe, Rupert Grint and Emma Watson have taken their roles to a new level, and you can feel the friendship between them, as well as the tension between Ron and Hermione. Additionally, Bonnie Wright delivered a sensational performance as her fifth film as Ginny Weasley. Us as viewers have grown with her during her time as being almost killed in the second film by He-who-shall-not-be-named to a brave teenager who has to deal with her own emotions, relationships, and tension between her and another leading character. (I won't spoil it for those who haven't read the epilogue of the last book) She will rush into battle at her teenage love's side with little regard to her own safety and you can see it in her eyes. Jim Broadbent is our "new" character for this movie, which is the standard M.O. for each year at Hogwarts. Jim, as usual for him lately, delivers a strong performance, as he gets behind the motivation of his character and expresses that in many ways on the screen, from his body language to the tone of his voice. The other leading characters continue to perform as expected or better. I once thought Michael Gambon wouldn't be able to truly replace Richard Harris as Dumbledore, but four movies later, he surprised me by exceeding what I expected of that role. Alan Rickman as Professor Snape and Helena Bonham Carter as Bellatrix Lestrange were excellent, but this story limited their screen time and seemed to muzzle them to an extent; I'm sure we'll see them let loose in the next two installments. Use of locations/Costumes/Special Effects (D): There was nothing new concerning the locations that we really haven't seen before. Yes, there is a special cave scene, that reminds me too much of Superman I/II, Pete's Dragon, Atlantis:The Lost Empire, or dare I say, even the upcoming Hobbit movie (probably because of the Rankin-Bass version, and the fact that some creatures in this cave looked a little too much like Gollum) Costumes have been standardized from the previous movies, and with the exception of the main opening scene, which seems to be a deliberate attempt to make a special effects scene just for 3-D and no other purpose, the special effects aren't overdone. But that's not enough to pull it out from a D grade. Movie Score (F): This score was unremarkable, with no themes that I could recognize that reappeared at times of the movie. I don't recall hearing the traditional John Williams Harry Potter theme. That may have been able to pull it up to a D grade. Final Grade: My scoring brings it to just below a regular C. Using my discretion to award or subtract points I bring it down to a C-. While the actors' performances were unexpectedly excellent, it isn't enough to correct the problems with the story. Had the story been just about the kids growing up, this probably would have been a much better movie. But that's not what the books were about. So that's not what the movie is about. Like Transformers: Revenge of the Fallen, this movie suffers from an identity crisis - not knowing what kind of movie it wants to be, and in doing so it can't fully succeed. Hopefully we'll see them expand upon this for the epilogue of the 8th movie. I would look forward to seeing it. Harry Potter and the Half-Blood Prince images © Warner Bros.. All Rights Reserved.